Last weekend, I was searching for a flavorful side to go with pork tenderloin. I wanted something that was savory because I find pork tenderloin to be somewhat bland. 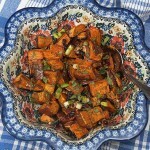 I like sweet potatoes with pork, so their recipe for roasted sweet potatoes, with a maple vinaigrette, sounded enticing. I served it hot, and my husband and I thoroughly enjoyed it. 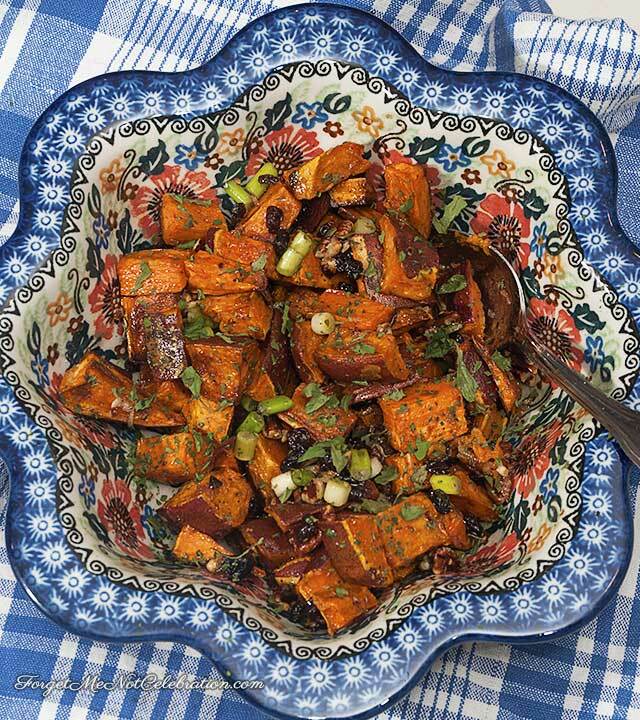 Preheat the oven to 375 degrees F. Cut the scrubbed unpeeled sweet potatoes into ¾” cubes. Spread them on a baking sheet and drizzle with olive oil. Sprinkle with salt and pepper and mix together. Roast for about 30 minutes until tender. Turn the potatoes over midway through the cooking. While the potatoes are roasting, gather the remaining ingredients. To make the dressing, whisk together the olive oil, maple syrup, sherry vinegar, lemon juice, orange juice, fresh grated ginger, cinnamon and salt and pepper to taste. Toast the pecans on a separate baking sheet for 5 minutes. 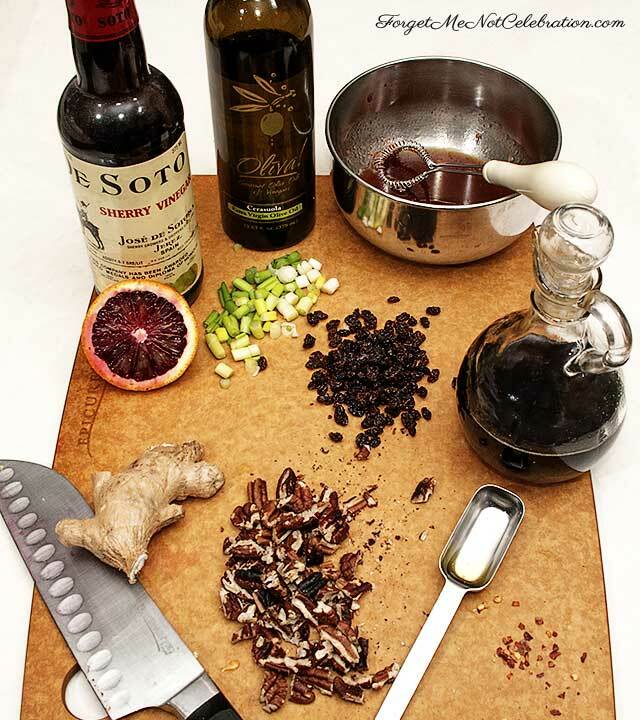 After toasting, chop the pecans coarsely. When the potatoes are tender, remove them from the oven and put them in a large bowl. Add the green onions, parsley, cilantro, red pepper flakes, pecans and raisins. Pour the dressing over the ingredients and toss gently. Serve at once or at room temperature. NOTE: I did not include cilantro in my version and I reduced the amount of parsley to 2 tablespoons. Additionally, I used currants instead of golden raisins. Use sweet potatoes rather than yams if you want the added nutritional benefits.